Zest Highly Caffeinated Tea is a blend of black tea, fruit and extra caffeine. The caffeine in Zest Tea can range between 135 - 160mg due to variations in the tea leaves used. Zest recently sent us some free samples to try out. Since Zest is touted for being more caffeinated than a cup of coffee, I decided to replace my daily 2 cups of coffee with 2 Zest High Octane Teas. I had one Blue Lady Black first thing in the morning and a Pomegranate Mojito Green at about 10am. Zest was an adequate replacement for my coffee and delivered about the same level of wakefulness that I'm accustomed to. Since I don't use sugar, I was concerned that the bitterness of the extra caffeine would come through, but the fruit flavors did a nice job of making the teas enjoyable to drink. As far as bitterness goes, it didn't seem any different than regular black or green tea consumed without sugar or milk. Personally, I still prefer my coffee, but Zest Tea is a great alternative for those looking for a hot beverage with a stronger dose of caffeine, but don't like the taste of coffee. A cup of Zest Tea is made using one Zest pyramid tea bag and 8 fl oz of hot water. Zest Tea is highly caffeinated and not suitable for children nor those sensitive to caffeine. 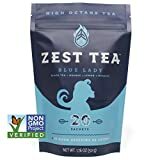 How Does Zest Highly Caffeinated Tea Compare? Zest Highly Caffeinated Tea contains 18.75 mgs of caffeine per fluid ounce (63.40mg/100 ml).